After the successfully winning of the ICC Cricket World Cup 2011, the cricket fever is going to continue as the Indian Premier League season 4 kicks off today. Today in the evening, the IPL owners and Champions League T20 champions will bring an equally imposing opening ceremony of the IPL 2011 that every cricket fan would expect. The IPL 2011 opening ceremony will kick off with number of breathtaking performances, a dazzling laser show, sizzling dance, and fireworks that will illuminate the evening skies. The IPL 2011 opening ceremony will be held on Chepauk stadium, Chennai from 03:30 PM. At the Chepauk Stadium, approximately 35,000+ audiences will be anticipated to become witness of the IPL 2011 Opening Ceremony. 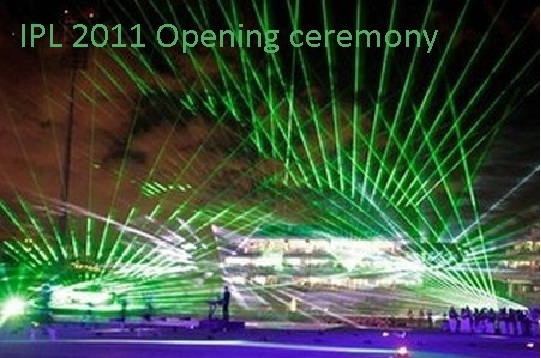 The opening ceremony of the IPL 2011 will also be broadcasted all over the world. Wizcraft Entertainment has organized the opening ceremony and Bollywood superstar Shahrukh Khan will be featured in the IPL anthem. Wizcraft has maintained secrecy about the official program yet it is assumed that a number of Bollywood celebrities as well as many international performers would perform in the ceremony. At the opening ceremony in Chennai, King Khan will be shaking a leg of the IPL. Along with Shah Rukh Khan, popular pop singer Sona Mahapatra, Kunal Ganjawala, Sunidhi Chauhan and Akriti Kakar will also join the opening ceremony. The IPL opening ceremony is expected to be hosted by the Indian Bollywood legend Amitabh Bachchan. During Opening Ceremony, Aamir Khan might give a guest appearance. First appearance of “Thayn Thayn” song from the movie Dum Maaro Dum will also be unveiled on the opening ceremony of IPL 4. Many TV channels will telecast the live opening ceremony of IPL 2011, including espn, star sports, star cricket, and Indian national TV channels. In the cricket world, IPL is one of the main events. As the India won the ICC Cricket World Cup 2011, IPL 2011 is anticipated to be watched by more cricket fans in India.